I made these pants last year, but have only just managed to get photos for you. The pattern is the Tessuti Chloe pant and the fabric is a very heavy weight linen bought from The Fabric Store in Brisbane. I made a size 12 and the alterations were pretty much what I normally do for pants. Shortened the leg length by about 5", took in the side seams at waist level, scooped the crotch (front & back) and took some fabric off the side seam at thigh level from the back piece only. The only other change I made to the pattern was to put the zip in the CB seam instead of the side seam. I have put on weight last year and am hopeful I can get it back off and get back to where I should be, so figured that would make taking them in later easier (hopeful?). I am petty happy with them and really like wearing them. However brilliant instructions and the finish on the facings is really neat. I would highly recommend this pattern. 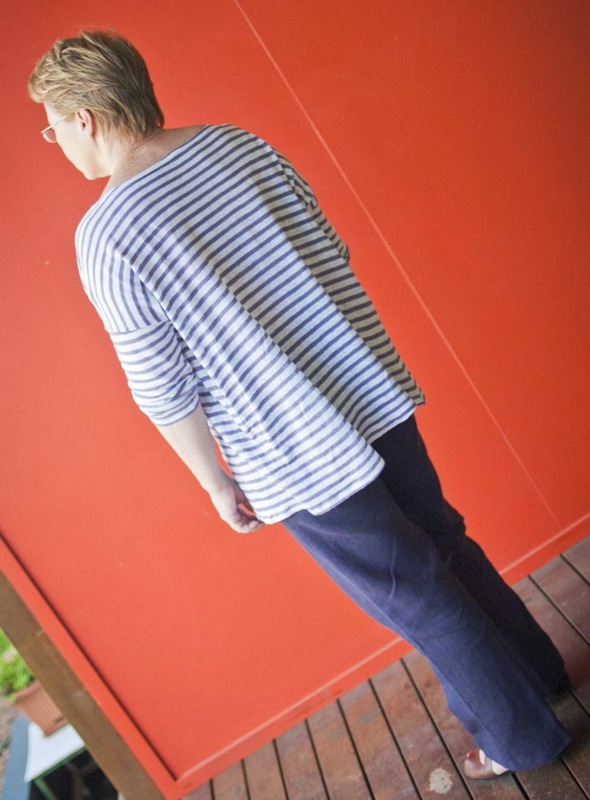 BTW the top is the Mandy boat tee (pattern also from Tessuti). Review is here Ciao kittens - more photos of finished items soon. These look lovely on you Sue, great colour, style and fit. Very nice pants, the fit looks perfect. These fit really well Sue. They look nicely made too. You have got a great fit with these trousers and the colour is lovely.